Jakarta Governor, Anies Baswedan opens Large Deliberation (Mubes) of Betawi Bamus VII.
" I hope Betawi communities could contribute more for Jakarta besides for culture preservation"
Mubes is done to choose Bamus Betawi Chairman after Zainudin or usually called Oding's leadership period. Based on beritajakarta.id monitoring, this activity wa s also attended by Jakarta Secretary, Saefullah; Jakarta MUI Chairman, Syarifuddin Abdul Gani; DPR RI member, Biem Benyammin, DPD RI member from Jakarta, Dailami Firdaus; BPK RI Chairman, Bahrullah Akbar; Betawi figures and Muslim scholars; and representatives from 98 Betawi organizations. Anies said, Betawi communities should help each other and collaborate with government to develop Jakarta together. "Alhamdulillah, today we can open Bamus Betawi Mubes. 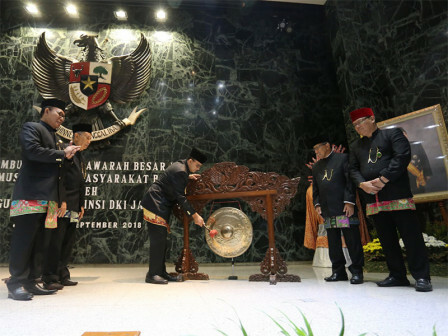 I hope Betawi communities could contribute more for Jakarta besides for culture preservation," he said at City Hall, Saturday (9/1). He explained, Jakarta is a part of historical story which is really important for Indonesian. For information, Jakarta Government has issued two legal basis related to Betawi culture. Besides Perda No. 4/2015 about Betawi Culture Preservation, his side currently issued Pergub No. 229/2016 about Betawi Culture Preservation Realization.